In 1600 there were in Calabria texts, those proved the use of pig meat. The production area of Pancetta di Calabria PDO is within the entire territory of the Calabria region. The pigs used for production must be born within the territory of the Calabria, Basilicata, Sicily, Apulia and Campania regions, and reared in the region of Calabria from a maximum age of four months, before being slaughtered and processed in the same territory. 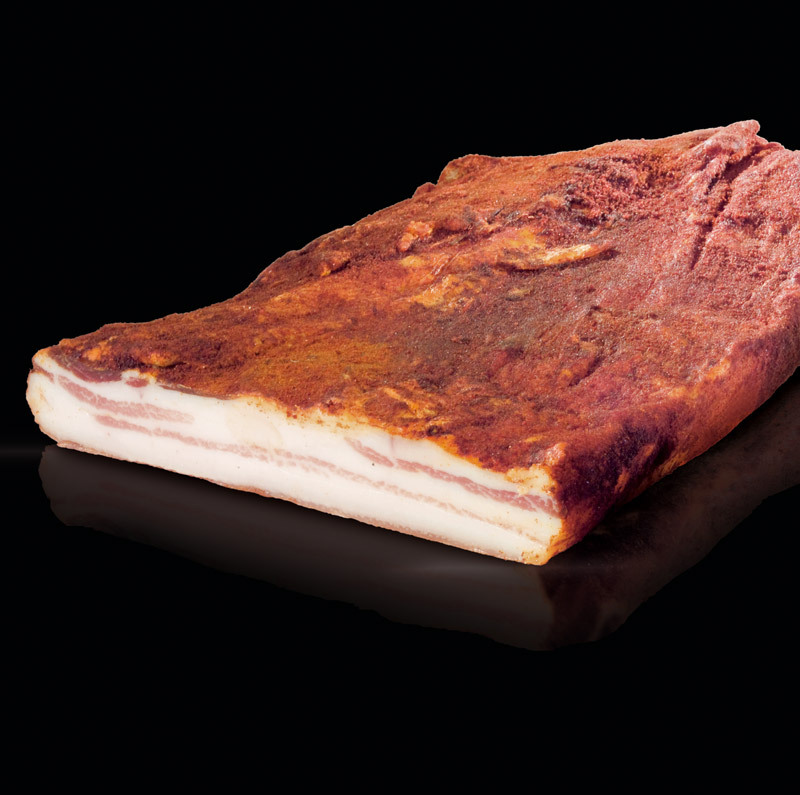 Pancetta di Calabria PDO is obtained from the under rib pork, and it has to mature for at least 30 days. Pancetta with the rind weighing between 3-4 kg is cut into rectangular shapes with a thickness of 3-6 cm. Pancetta is dry salted and then it is washed with water and moistened with wine vinegar. The surface can be covered with chili powder, after which it is left to cure for at least 30 days, in cellars with controlled humidity and temperature. Pancetta di Calabria PDO has a rectangular shape. Externally it can be characterised by a red colour, due to the presence of the chili powder. The slices are pinkish in colour, with thin alternating streaks of lean meat and fat. The fragrance is intense and natural and it has good strong flavour. Pancetta di Calabria PDO can be eaten raw, with the classic local salted bread cooked in the local wood-burning oven. Pancetta di Calabria PDO is used as an ingredient in regional recipes as pasta, with fresh broad beans or cooked legumes and polenta. Among famous estimators of Calabrian deli meats, there was Giacomo Casanova. During his trip to Calabria, he told that he had lunch, with the bishop Francescantonio Cavalcanti. Here he tasted the Calabrian delis, judging the best he had ever eaten. The quality of Calabrian pancetta takes origin from local pigs as result of an ancient popular wisdom. Protected Designation of Origin (PDO) recognized under Reg. ne EU Reg.to CE n. 134 of 20.01.1998 GUCE L. 15 of 21.01.1998.